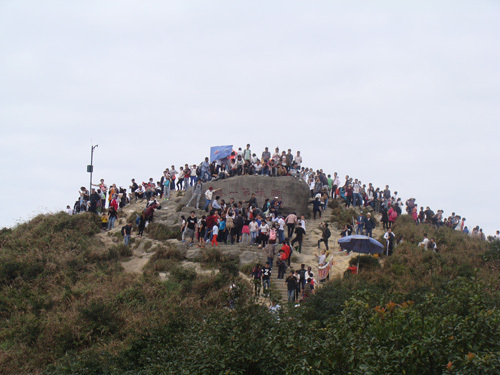 Wu Tong Shan (梧桐山) is a very popular hiking destination in Shenzhen China. 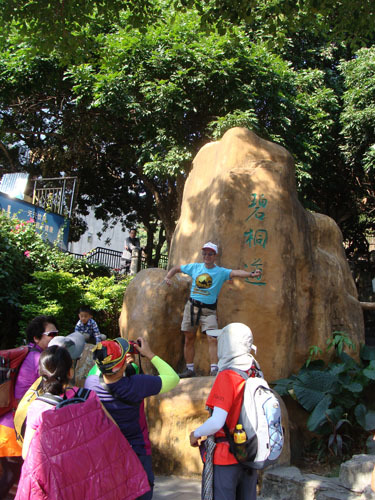 This mountain should the highest peak in Shenzhen. 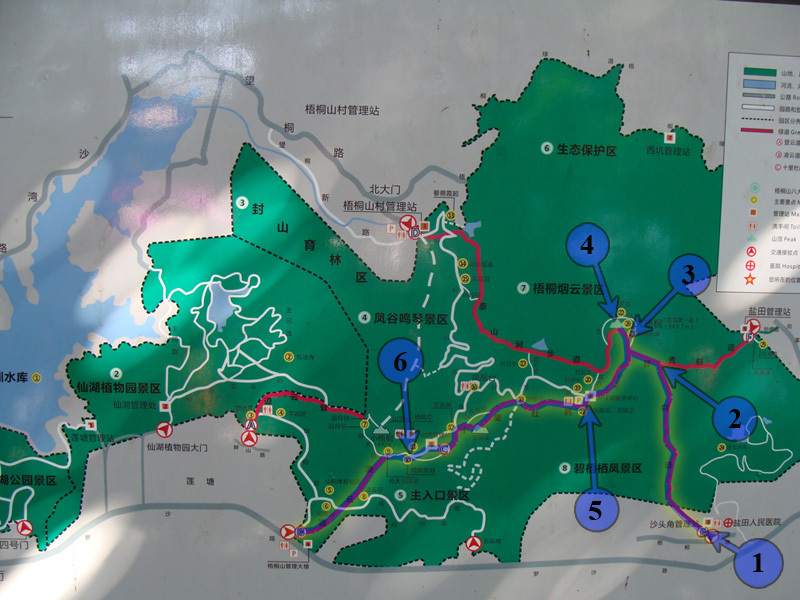 There are a number routes, all of them are easily accessible by public transport. Some of the routes are well paved with nice staircases. This time we took the easiest one to scale up the mountain. It is easy in term of difficulty but it is still quite physically demanding. There are 5000 steps for you to go up and 10000 steps for you to get down. 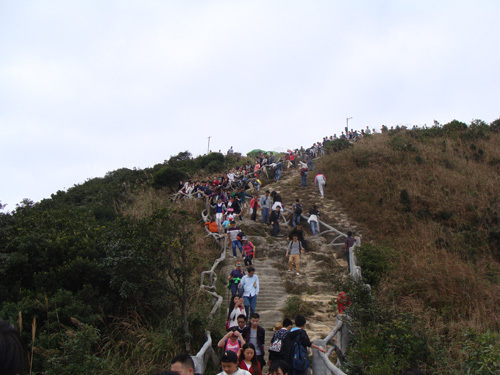 The upward path we took was called Bi Tong Dao (碧桐道). 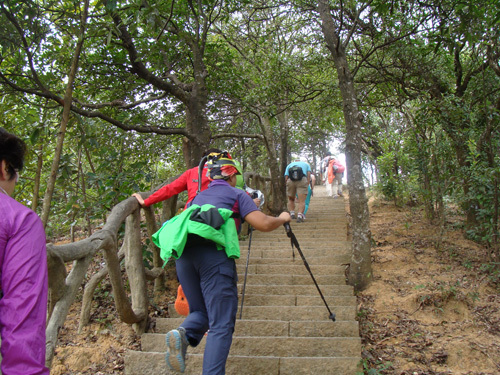 The downward path we took was called Ling Yun Dao (凌雲道). You won't have bring a lot of water for the route because there are hawkers selling water and snacks sparingly. One more thing, you may need a torch just in case it gets dark before you get out. This is the starting point of this journey. This entrance is by the road, quite easy to locate. Very soon we come to this hanging bridge. 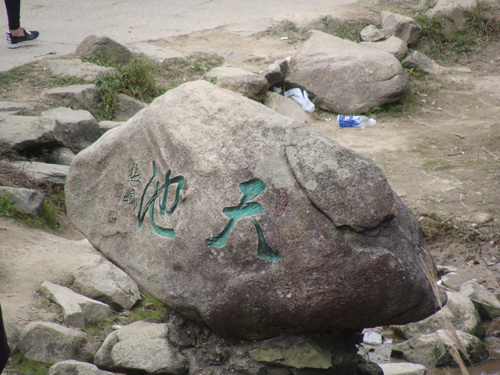 This is Bi Yu Dao (碧桐道). Most part of the route look like this: endless staircase. Come on, you are almost there. 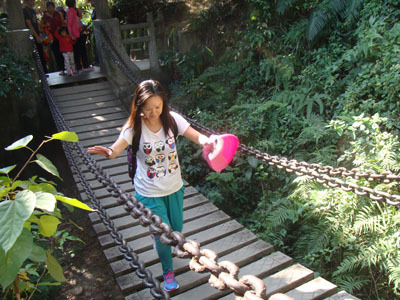 Just before reaching the top, there you find a Sky Pool (天池). Unfortunately, the pool was dry in our visit. Even if there was water, pool would be quite small and shallow. This is the top of the mountain. As expected, it is full of people. It happens to have a few tour groups visiting the mountain. 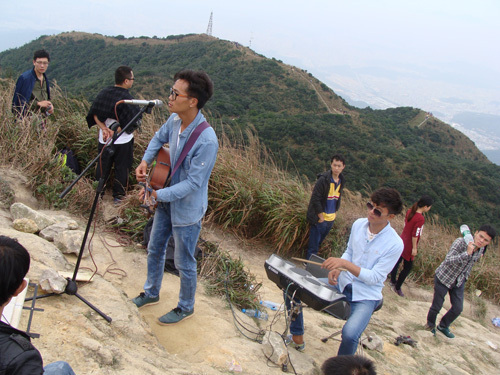 W heard some live music behind the rock on the peak. We were surprised to find band playing music there. They carried all the instruments, batteries, mic, amplifier and cables to play music. Wow! What a band! I was told this band play music there very frequently. Now we started going down hill. This portion is the steepest. 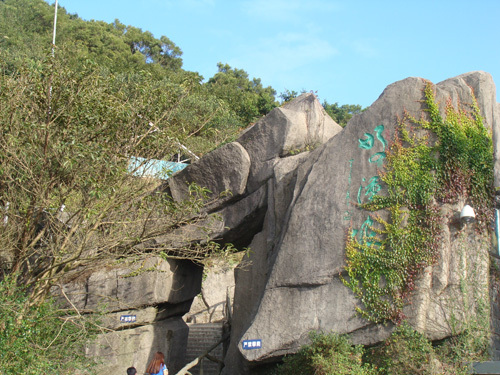 It is dubbed Hero Slope (好漢坡). 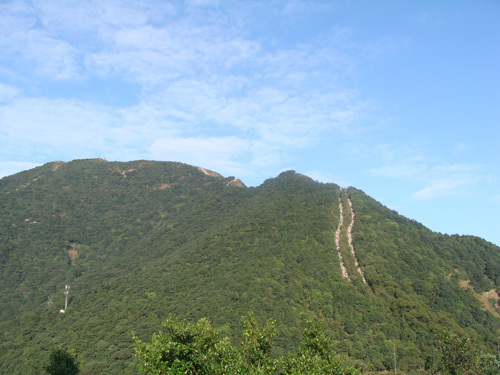 This is Hero Slope (好漢坡) from a afar. Finally we left the steep slope and can have a decent break. Here you have proper toilets and fast food shops. 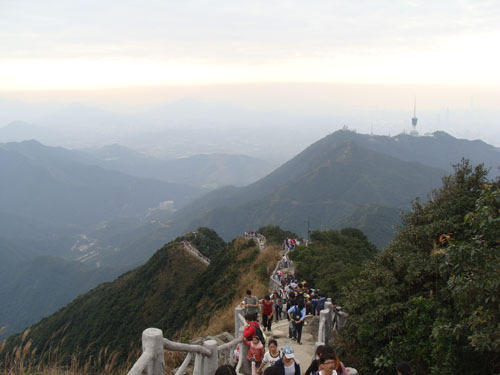 Here you can either take the cemented road to leave the mountain or keep on hiking on the footpath. If your energy is still abundant, you are advised to keep hiking which will bring you to another mountain with good views. This is exactly what I have done this time. 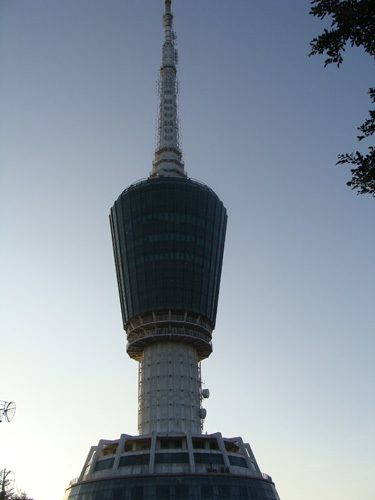 This is the Shenzhen TV Tower, one of the icon of Shenzhen skyline. We have seen this tower from HK side many times but it is the first time for close contact. We took Ling Yun Dao (凌雲道) to leave the mountain. 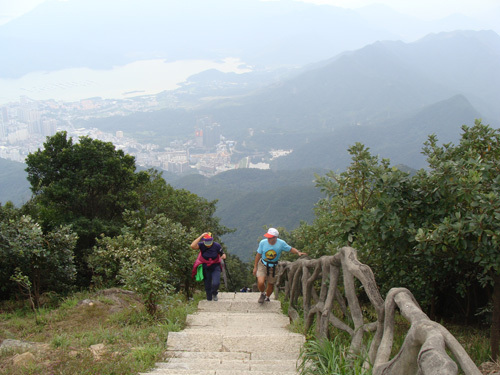 This Ling Yu Dao is also made up steep staircases. At the end of Ling Yu Dao is public transportation.